Google Now has always been good at giving you relevant information about things like transit, emails, stocks, sport scores, etc. But everything it displays is linked to a Google product in some way, which means that even with Google's vast accessible information, the scope of what information Google Now can provide is limited. Today Google has announced an update for the Google application on Android. 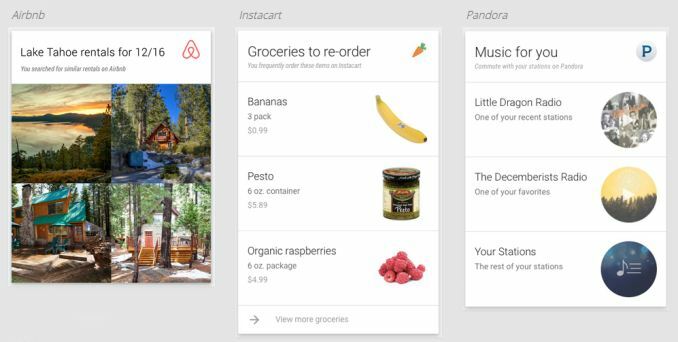 The update allows Google Now to display cards with relevant information from 40 different third party Android applications. The list of third party apps includes some big names like Lyft, Pandora, and Airbnb, and it's not hard to imagine how the ability to display relevant and actionable info in Google Now could make the experience of using these apps even better. The full list of partnered applications can be found here on the Google Now webpage, and you can see some example cards in the image above. According to Google, the update to the core Google app on Android is rolling out now, and updates for cards from the developers Google has partnered with will be rolling out over the next few weeks. Google also intends to expand the library of supported third-party applications over time. I'm extremely happy to see that they're doing the obvious thing (opening Now to third-parties), but in a slow and deliberate manner. Voice recognition has been a publicity stunt in the last 30 years and it will forever be the same. Its always going to be faster to do one tap on the weather app in 100ms than asking "Google now: how is the weather today?" Setting an appointment is much faster when using voice. In fact, I'm not even sure how to set an appointment manually as I've always used voice recognition for that. So there are certainly cases where it's faster, anything that takes more then 1 tap of course. Then there's all the hands free possibilities. Sending text while I'm driving etc.